I love this comforter...it's very soft and warm. The colors look great in our bedroom. While they say the darkest color is a charcoal gray and I think it is...it looks brown in our room which is what a I wanted. 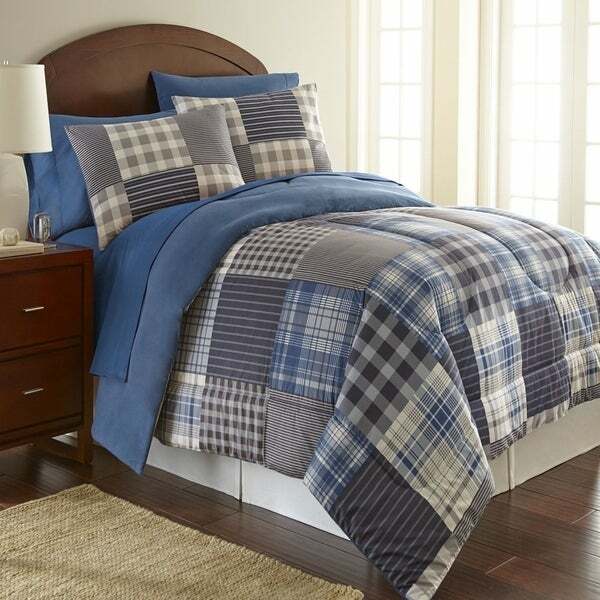 A plaid patchwork design in bold yet neutral colors tops this warm and comfortable Micro Flannel 3-piece comforter set. Crafted of quality polyester, this set is conveniently machine washable. I absolutely love this comforter. It looks good and is s soft and warm. Nice comforter and shams. Soft and warm. Very warm...flannel lined. My 16 year old son loved this as a Christmas gift. I love this comforter. It’s in my 3 year old son’s bedroom and it looks great and he loves it. It is warm and my little guy sleeps hot so he regularly wakes up drenched in sweat, but at least he’s not freezing cold ever. The quality of the material is pretty good however the "quilt" pattern looks cheap like it was screen printed onto the fabric. I am keeping it but looking for a replacement. We purchased this for our son’s room and absolutely love it! The colors are great and he loved the softness of the material. The comforter is a much more green/gray color then the gray in the picture. Item is as described. Very warm. Great for me as I get cold in the winter. Plus it looks awesome. So cozy and inviting on those winter nights. held up good. as described. "Can someone please tell me the exact colors in this comforter. I thought it was blues and browns/tans which is what I was looking for. At a closer look...what I thought was brown looks gray. Thank you!" "Can someone tell me the exact colors in this comforter? I thought at first they were blues and browns which is what I'm looking for, but at a closer look...it looks more like gray and blues. Thank you!" The comforter contains primarily shades of grays and blues. Because I have plaid curtains and this will go with basically any blue plaid curtains.